Published: Jan. 1, 2017 at 07:17 p.m.
San Francisco 49ers quarterback Colin Kaepernick connects with tight end Garrett Celek for a 9-yard touchdown. Published: Dec. 24, 2016 at 07:31 p.m. 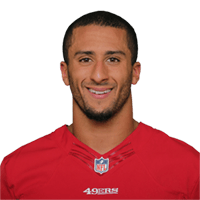 Published: Dec. 24, 2016 at 07:13 p.m.
San Francisco 49ers quarterback Colin Kaepernick runs in a 13-yard touchdown. Published: Dec. 24, 2016 at 04:46 p.m.
San Francisco 49ers quarterback Colin Kaepernick finds open running back Carlos Hyde for a 19-yard touchdown.